For those of you who have been following me for a while, you’ve probably discerned that I have a fascination with lists and quests. It started with the very first page published here at Location Rebel: My bucket list (which is getting an overhaul shortly). A couple years after that I set out to experience the Top 100 golf courses in the world, which has been the goal I’ve been most active in chasing – and I’m currently sitting at 41 out of 100, and 49/100 in America. But there’s another quest that most of you probably don’t know about. What started as kind of a joke, has recently taken on a life of its own. The goal? Visit the top 50 bars in the world. On it, I noticed the Dead Rabbit on the southern end of Manhattan was voted the #2 bar in the world. Never one to turn down a good story (or a good drink) Dan said “I’ll grab the Uber!” and away we went. At the time I had no idea that moment would lead to me becoming a patron of some of the very best bars and sipping on the very best drinks across the globe. When the most recent version of the list came out, I was kind of dreading it. I knew that inevitably places that I’d already been would fall off the list, and as the cocktail scene becomes more of a global phenomenon, inevitably they would be replaced by a bar in a location far less convenient than New York City or London. On the 2016 list, I’d been to 28/50. On the latest 2017 list, I’ve been to 28/50 and 47/100, on the current list I’m at 21/50 and 31/100. If you’d like to follow along and read more about my bar quest and my travels, take a look at my travel site Slightly Pretentious. One of my favorite parts about now having visited so many of these establishments, is you get to start forming your own opinions. You can compare and contrast everything from concoctions to ambiance – and when someone says “oh, have you been to….” very often, the answer is, “why yes I have!”. That said, with this most recent list, there are both rankings I strongly agree with, and others that have left me completely dumbfounded. So in honor of the latest list being released, this is my take on how the numbers shook out. What you’ll find below is essentially a negroni of a blog post. The Negroni is one of the simplest classic cocktails you can make with equal parts gin, Campari, and vermouth. So what I mean by this, is below you’ll find equal parts travel journal, personal favorites, and critiques from the most recent list. I hope you enjoy reading as much about these unique global experiences as I’ve had experiencing them. If there’s one thing that nearly all of these bars have in common, it’s that they all have excellent drinks. But having been to the Nomad a number of times, and actually staying at the hotel on this most recent trip, I can say that consistently I’ve had some of the most inventive, original, and high quality drinks at Nomad. They don’t have the elaborate presentation of some other places on the list, but regardless of what you order there, you can be sure it’s going to be delicious. This was so close. I visit the Dead Rabbit every time I’m in New York, and this most recent trip was a reminder of why it’s consistently ranked in the top 5 in the world. Just make sure you venture into the cocktail parlor upstairs. I recommended friends visit, and they didn’t get past the Irish pub on the first floor. Employees Only was one of the first bars to really revolutionize what a cocktail bar is. Yet, the last couple of times I’ve been there I’ve walked away saying “that was pretty good.” It’s still clear why it’s in the Top 50 in the world, but it’s also not tough to tell why it isn’t a staple in the top 10 anymore. Right now, American Bar at the Savoy Hotel in London is the #1 bar in the world. In some ways I get it. It’s got insane amounts of history and is one of the places credited with essentially creating the craft cocktail. But when we visited, we had three drinks each. And honestly, none of them really wowed us. Sure they weren’t bad, but for a place steeped in so much history that is consistently recognized as the best in the world? It didn’t live up to the hype. I’d love to return and be proven wrong, but if there’s one bar we visited that was total let down, this was it. Star Bar for a long time was the quintessential cocktail bar in Tokyo. Upon our visit, I found the vibe to be pretty cool, but the drinks to be a bit lacking. I simply had a standard old fashioned, which you would expect to get nailed every time, but I was less than impressed. It’s worth visiting, but in a city featuring some of the most unique and memorable bars I’ve ever been to, this one just didn’t do it for me. At least gotta give them props on the perfectly clear ice cube. These days this is basically expected at bars of this caliber. This is the most recent bar I’ve visited, as I checked it out earlier this month in Las Vegas, Nevada. Now for a city known for it’s opulence, and over the top, well, everything – you’d expect the lone top 100 bar in the city, to be something special. Not only was it not special, I hate to say this, but it was down right bad. First off, it’s located a big boxy building in a pretty ugly area of town, and looks like a better fit for a mediocre sports bar than a top 100 bar. The menu concept was actually pretty cool, featuring drinks by era: Pre-Prohibition, Prohibition, Rat Pack, Tiki years etc. But unfortunately, the drinks really didn’t live up to the hype. For instance, the old fashioned was served on regular bar ice that melted quickly, and felt like something you’d expect at a mediocre steakhouse, rather than a world renowned cocktail bar. Maybe it was just me, but frankly, I just didn’t get it. About a 20 minute walk down Fuxing Lu from the world class Speak Low, Union Trading Company was quite the let down. We went early and were one of only two groups in the bar, and yet were completely ignored by the bartenders the whole time. In asking questions about the bar, and types of drinks we got short answers, and they seemed completely uninterested in helping out. The drinks were average, and it was an easy decision to walk back to Speak Low and spend the rest of the night there drinking some of the most delicious and inventive drinks on the planet. Update: As of the 2018 list, this bar is no longer in the Top 100. 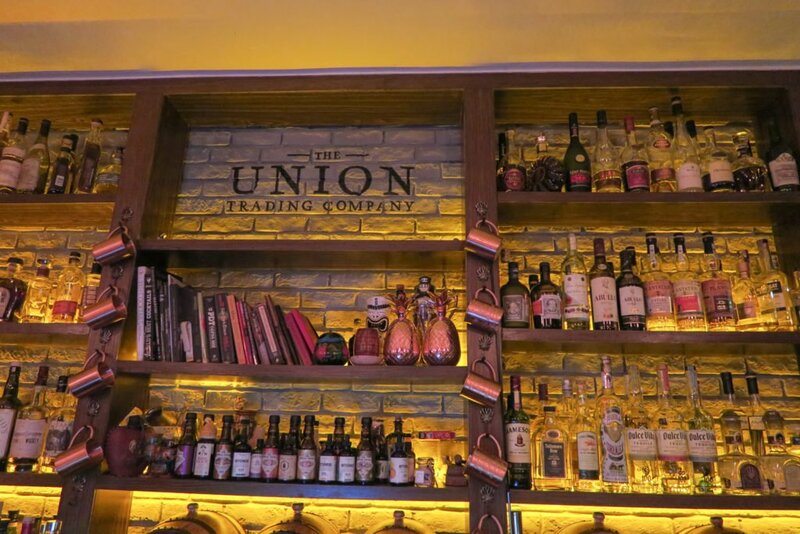 The bar at Union Trading Company in Shanghai, China. After visiting Singapore and Tokyo a few months back, I made a pact to never do another trip just for bars again – it takes a lot out of you! Well this next trip on May isn’t just bars. I mean there are plenty of other things to do in Europe, right? The Connaught Bar in the Connaught Hotel in London is without a doubt the fanciest bar place I’ve ever been. My wife Tate and I had been wandering the streets of London all day, we had sneakers and jeans, and I was carrying a backpack. We walked in and immediately felt like we should have been in a tuxedo and gown to step foot in the place. But to our surprise, the servers treated us wonderfully. They’re known for their martini that they bring on a trolley to your table, and then give you the choice of one of 7 different “tinctures” to subtlety enhance the flavor. Next to the Laphroaig rinsed martini at Russ and Daughters in NYC, it’s the best martini I’ve ever had. Tate had a passion fruit cocktail that may have been even better. If there’s one thing I learned about bars in Tokyo, it’s that many of them are notoriously hard to find. Even when you’re in the elevator, you don’t really know if you’re in the right place. But once you step out into a drab apartment building hallway, the big wooden door gives it away. And when you go through there….boy are you in for a treat. On our last night in London, Tate and I had five bars to make it to. It started with Happiness Forgets in the Shoreditch neighborhood of London. We walked around for 20 minutes, no luck. We asked people in the area, no one had heard of it. Finally, we found some stairs that went down to this subterranean bar and were treated to a small, unpretentious bar serving wonderful drinks and a great bar staff. All night we kept saying we wanted to go back, as once inside everything about the experience just felt, comfortable. Portland is one of the best bar cities in America, yet they have yet to receive any love from this list. For the best bar that should be on the list, it came down to tiki bar Hale Pale, and the bougie Multnomah Whiskey Library. But there’s something about Hale Pale that just does it for me. It’s basically like an adult Rainforest Cafe, in a strip mall, that whisks you out of Portland and into a tropical paradise for a couple hours. The drinks are the best tiki drinks you’ll ever find, and I found them to be a step above the current tiki king on the list, Smugglers Cove in San Francisco. Canon was supposed to be a quick stop in for a drink before heading somewhere else for dinner. A quick drink turned into a full dinner and three + hours sitting at the bar talking to the bartender. I’ve watched Canon slowly slide down the list in the last few years, and I don’t get it. It has the largest collection of spirits I’ve ever seen. It’s huge, and nearly one hundred pages long. But the most memorable part of the evening was it introduced us to the Stiggins Daiquiri. An incredibly basic concoction made from lime juice, simple syrup, bitters, and Plantation Pineapple Rum. This drink has become a staple for guests at our home. A nice place to work, right? On the 2017 list, there was one huge surprise. If you’re an OG subscriber, this may sound familiar. We’d go late in the morning with our laptops and work, before hitting the pool and sipping on $4 Bintang beers until sunset. So to see this on the list was a huge surprise, and if I had to guess when the next iteration rolls around in October, this one will probably fall off – but man what a nice hit of nostalgia. I’ve been to Quinary twice now, and while it’s a solid bar, I thought the newcomer to the list, Stockton had both a cooler vibe and better drinks. But Quinary wins the award for one of the coolest “party tricks” I’ve seen in the sense that it was the first time I’d seen anyone smoke a cocktail. For their Manhattans or Old Fashioneds, they would turn over a glass and pump smoke into, before pouring the cocktail in. The result was a fantastic experience for the senses, and someone who likes smoky things, I was in heaven. PDT (Please Don’t Tell) is one of the most famous bars in the world, and for good reason. You walk into a seedy feeling hot dog stand in the East Village and see a vintage telephone booth that feels wildly out of place. You go in, dial a number, and they ask if you have a reservation. If you don’t, they’ll probably tell you to leave and never come back as the wait will be outrageously long. But if you do, a hidden door in the booth opens up, and you are whisked into a hidden speakeasy that is sure to impress any visitors to town. In my 3 times there, the drinks are good, but not quite on the level of the other bars on the list. That said, their cocktail book is my best recommendation if you only wanted to buy one cocktail book that has everything from the basic classics, to drinks that have a few more exotic ingredients. A couple years ago I took a whirlwind trip through Scotland, to visit the distilleries on Islay and play some of the best golf courses in the country. After my first round at the Old Course in St. Andrews, I hightailed it to Edinburgh to visit Bramble, the only Scotland bar on the list. But what made this experience the most special was the fact that Location Rebel Academy members Karen Marston and Gary White came and joined me! Always cool to meet community members in person. While bars like Nottingham Forest or Speak low, went elaborate with their presentation of cocktails, I think the Gibson wins for the most elaborate, out there drinks of any place I’ve been. Rather than have me tell you about them, just take a look at the menu. Our experience here was a little soured due to a very rude patron, and it being pretty crowded on a rainy Friday night, but this is one I’d very much like to experience again given more time. In a random chance encounter at Speak Low in Shanghai, world famous bartender Nico de Soto from Mace in NYC was doing a guest bartending shift one of the nights we were there. It turns out he’s one of the only people I know to have actually been to all 5o of the current best bars in the world. His favorite? Operation Dagger in Singapore. His least? Nottingham Forest in Milan. While I haven’t been to any of the Singapore bars, I can’t totally disagree with him on Nottingham Forest. None of our drinks were all that great, specifically from a taste standpoint. But from a presentation and experience stand point? Different story. A “Mexican BBQ” cocktail at Nottingham Forest in Milan, Italy. A drink that was served in what a glass that had two big valves coming out of it. There was a different smell in each valve. One had lemon, and one had cinnamon. Depending on which side you drank out of, the drink tasted completely different due to the smells. So while the drinks weren’t the best flavor wise, the experience makes this a must visit if in the area. We’d already had a drink at Bar Ben Fiddich in Tokyo, and it was becoming increasingly clear this place was for real. My friend John decided to put him to the test. The bartender smiles, and his bar backs proceed to grab a couple of bottles. It was a Negroni made with ingredients that were all bottled in the 1960s. Both Dante and Bar Termini feel more like Italian cafes than bars. This makes them unique compared to most of the bars on this list. But both were quaint and served unbelievable negronis. Let’s face it, most people don’t go to Munich during Oktoberfest for cocktails. After an afternoon partaking in the festival, we decided we needed to give ourselves a break from beer and went about wandering the city. I’d remembered hearing about Schumann’s and as we were walking down the street, I looked up, saw a sign for it, and walked in. It was a total fluke we happened to make it in, as I wasn’t expecting it would work out to go on this trip. Even better, just a couple days later, the updated top 100 list came out, and Schumman’s had slipped back into the Top 50. Maybe it was the fact it was our 5th spot of the night in a whirlwind tour of the best bars in London, but it was one of our favorites from the trip. The menu was great, the vibe was cool, and it went from top 50 in 2016, to off the list completely in 2017. You’d think we’d be better at planning ahead and doing some research than we are. But while we were at Oriole, we were asked where we were going next, and said “Nightjar”. Since these two bars were owned by the same company, the manager from Oriole called ahead and secured us the very last table for two that was open. When we arrived the place was packed with a huge line outside. One thing you’ll learn when you start frequenting some of these bars is that often as much time goes into the menu, as the drinks itself. The Dead Rabbit had an entire graphic novel created that told the story of the NYC street gang the Dead Rabbits (and the story of the cocktails). Blacktail created a thick hardbound book telling the story of their history. But one of the coolest was found in probably the weirdest bar I’ve been to on the list: Bar Orchard Ginza. You end up in a tiny bar that feels like you’re in the owners living room. On the bar is a giant fruit basket. It’s filled to the brim with strawberries, bananas, bell peppers, ginger, cilantro – the list goes on. You pick something and they build a drink around it. The Flirtibird at Speak Low tasted just as good as it looked, and was one of Tate’s all time favorites. Multnomah Whiskey Library (Portland, OR) – Great cocktails, great whiskey selection, super cool vibe. World class. Deadshot (Portland, OR) – One of the top 10 places I’ve been for drinks anywhere. Just need to work on that ambience. So what are your favorite bars across the world? What should I add to my personal “to visit” list? Leave a comment below and let me know. Want help building a business that gives you the time, money, and freedom to pursue a quest of your own? Well, that’s what I’m here for! Thanks for the tips! This article was perfectly timed- I read this while in London so last night we went to Calooh Callay and Happiness Forgets (You’re right, hard to find and we walked right by it twice.) Both were good, but HF was the winner. Great drinks, cool vibe, and the staff was insanely nice. Dude awesome to hear you made it to some of those! I can go on and on about the reasons why I like these, but totally agree in each case they’re a little more subdued. There are other bars in London you could have gone to where you walk in and immediately say “yep, I get it”.